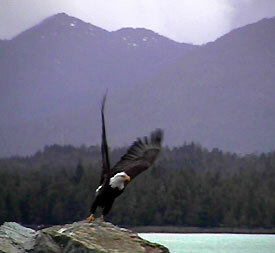 While waiting at the docks for our floatplane to fuel, this bald eagle took flight. Shortly after that, we did. Along with assistant guide John Rommen and New York hunter Tom Rakauskas, we loaded up the beaver float plane for our trip to a remote bay in Southeast Coastal Alaska. My guide from some of my previous goat hunts, Johnnie Laird (Muskeg Excursions) was already waiting for us at the float house. 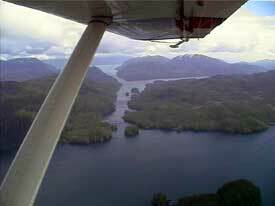 The flight in was a smooth one, we flew between the mountains of the Misty Fiords National Forest and along the coastal inlet of the Portland Canal. Our pilot, Jeff Carlin (Carlin Air) took slightly over one hour before we hit the inlets of Halibut Bay - home for the next twelve days. 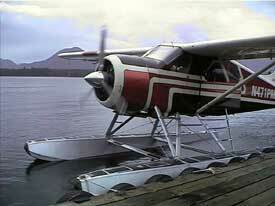 Jeff from Carlin Air fired up the DeHavilland Beaver and we were on our way into the Misty Fiords. 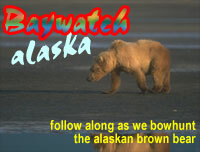 As we circled the grass flats where we would do much of our hunting, we spotted three black bear feeding in daylight. A good sign. Johnnie was waiting for us on the dock as the plane landed on the bay. We unloaded our gear and Jeff, our pilot, headed back to Ketchikan. It took us a while to get organized but as soon as everything was in order Tom and I wanted to check out the area. We took a boat trip around the outer beaches and spotted numerous black bears. We ended the evening with a great dinner of grilled New York strip steaks and hit the sack. The weather was nice all day but it was deteriorating into the typical drizzle and cold misty air that this part of Alaska is famous for.